Italian mothers cooking, a slow braised veal shank with saffron risotto. Classic dish of the Lombardy region in Italy. This region with the capital of Milan is also famous for Gorgonzola & Gran Padano cheese. 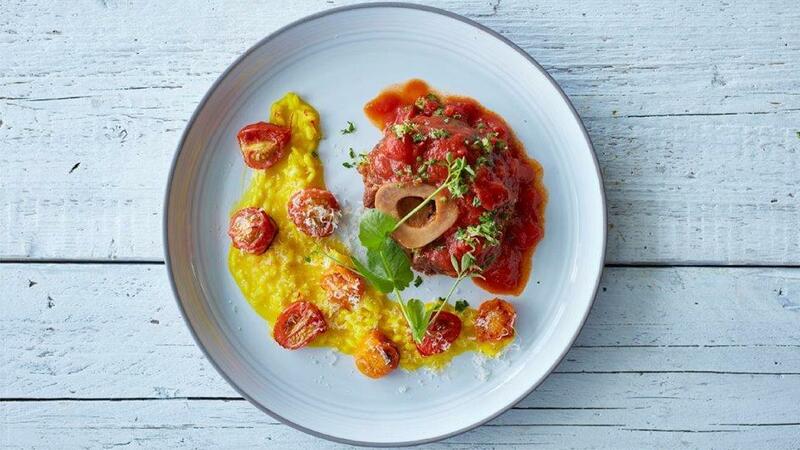 Knorr Tomato Pronto makes this dish quicker and easier to prepare. Get cooking on this recipe today! Season the veal shanks with salt and pepper. Fry the shanks in oil until golden brown. Remove the shanks and fry the onions, garlic and carrot, add Knorr Tomato Pronto. Prepare Knorr Demi-Glace, by simmer with hot water until just dissolved and add to the shanks. Add herbs and bring to boil. Put the sauce together with shanks and vacuum in a vacuum bag. Prepare sous-vide for 6 hours on 85 degrees Celsius. Take the shanks out of the bag and keep them warm, blend the sauce, sieve and season with salt and pepper to your desired taste. Cut the tomatoes and dry the on a low temperature (80 degrees Celsius) in the oven until they are half dried. Fry the chopped onions in olive oil without coloring. Add the rice and fry it gently for 2 minutes. Dilute Knorr Aromat Seasoning Powder, in hot water and add in small steps to the rice. Stir on a low fire. When the vegetable stock is soaked into the rice and the rice is “all dente” add the Astra Fat Spread and the parmesan cheese. Season if necessary with salt. Chop the parsley and the garlic. Mix with the zest of the lemons. Put the veal shank on warm plate and cover it with the tomato sauce. Plate the risotto and put the dried tomatoes on top. Finish with the gremolata and some extra parmesan cheese.